Like the chimpanzees in our last post, Einstein solved problems with a combination of body thinking and visual imaging. You might not think that chimpanzees solving animal puzzlers—like how to get hold of an out-of-reach banana—would illuminate scientific thinking, let alone the scientific thinking of Albert Einstein. 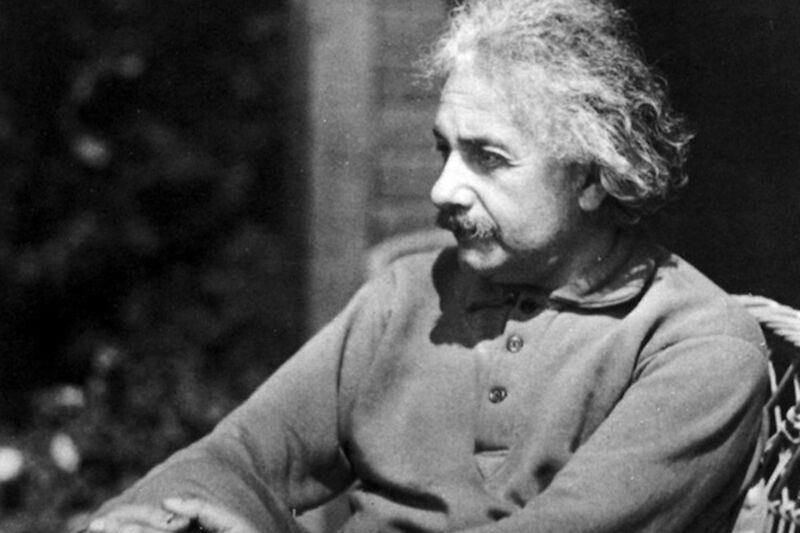 Einstein is about as great a human genius as one can find. Moreover, psychologist Howard Gardner has characterized Einstein's genius as stemming from his "logico-mathematical" mind (Gardner, 1993), something we can all agree that chimpanzees just don't have. Chimps - well, they're just not in Einstein's league. Well, let's see. We argued in our previous post that chimpanzees solving physical problems use a combination of body (or kinesthetic) thinking and visual imaging. Unexpectedly, so did Einstein. 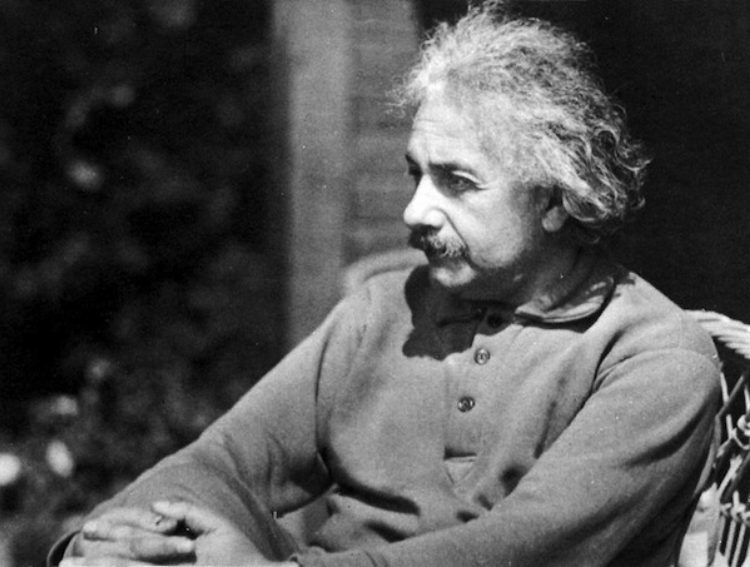 Contrary to Gardner's characterization of Einstein as someone who thought primarily in mathematical symbols, the great scientist himself wrote in his autobiographical notes, "I have no doubt that our thinking goes on for the most part without the use of symbols, and, furthermore, largely unconsciously" (Schilpp, 1949, 8-9). He expanded on this theme in remarks to Jacques Hadamard, stating, "The words of the language, as they are written or spoken, do not seem to play any role in my mechanism of thought. The psychical entities which seem to serve as elements in thought are certain signs and more or less clear images which can be 'voluntarily' reproduced and combined.... The above mentioned elements are, in my case, of visual and some of a muscular type" (Hadamard, 1945, 142-3; see also Wertheimer, 1959, 213-228). This puts Einstein's famous gedanken or thought experiments, in which he imagined himself feeling like a photon moving the speed of light, into a whole new light. By his own admission, one of the greatest of human minds did not think in words or numbers, but in bodily feelings and mental images! So who's aping whom here? 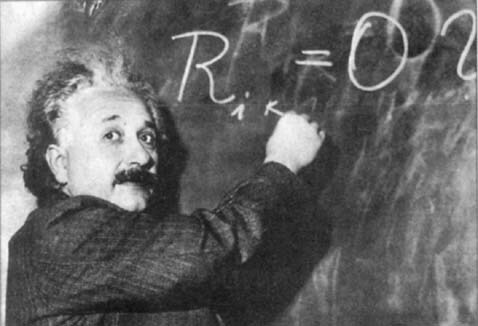 Those who are really familiar with Einstein's work agree that he was, in fact, mathematically challenged. 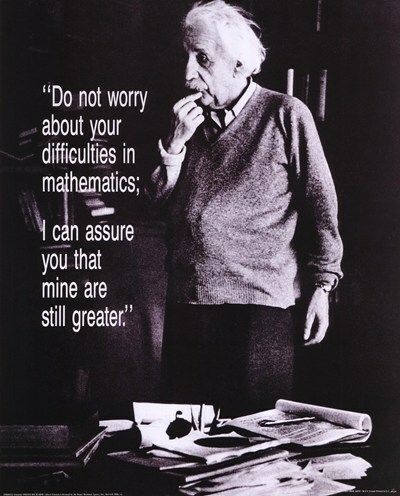 He wasn't kidding when he replied to a letter from high school student Barbara Wilson, "Do not worry about your difficulties in mathematics; I can assure you that mine are still greater" (Calaprice, 2000, 252). Indeed, he gave up on mathematics early in college when he realized, as he put it, that "[m]y intuition was not strong enough in mathematics to differentiate clearly the fundamentally important... from the rest" (Schilpp, 1949, p. 15). Quite a handicap for a world-class physicist! So how did he manage to translate the insights he gained through visual and bodily thinking into "E = mc2" ? He did it by working with collaborators - all of whom were mathematicians -- in a distinctly secondary step in his creative process, one that involved the translation of his private intuitions into public forms of communication: "I very rarely think in words at all," he wrote to Max Wertheimer. "A thought comes, and I may try to express it in words afterwards" (Wertheimer, 1959, 213). To Hadamard he explained similarly that "[c]onventional words or other signs [presumably mathematical ones] have to be sought for laboriously only in a secondary stage, when the associative play [of images and feelings] already referred to is sufficiently established and can be reproduced at will" (Hadamard, 1945, 143). Now THAT'S interesting! Einstein THINKS in images and feelings, but he COMMUNICATES in symbols. And it's that secondary communication that clearly differentiates the physicist from a chimp. No chimpanzee can perform this translation and communication task at the level of a normal human adult, let alone an Einstein. Nevertheless, the fact that there is, first, a thinking phase and, second, a translation phase of creative problem solving, and that chimpanzees can think their way through some types of physical problems as well as human beings, should give us pause. In teaching physics (not to mention other sciences) have we been aping the wrong aspects of great thought? Of what value is it to be able to write "E = mc2" if a student cannot imagine, using his or her mind and body, what that equation means? It may very well be that we've been confusing how we think with how we communicate. If so, we've put the proverbial "cart before the horse". We don't need an equation to figure out how well that arrangement is going to work! So let's try aping Einstein. Let's put the horse in front of the cart where it belongs and see what happens. Might a student who cannot write the equations for a problem in physics still be able to solve physical problems? Stay tuned! Calaprice A, ed. The Expanded Quotable Einstein. Princeton NJ: Princeton University Press. Hadamard J. An Essay on the Psychology of Invention in the Mathematical Field. Princeton NJ: Princeton University Press, 1945. Gardner H. Creating Minds. New York: Basic Books, 1993. Schilpp P, ed. Albert Einstein: Philosopher-Scientist. Evanston IL: Library of Living Philosophers, 1949. Wertheimer M. Productive Thinking. New York: Harper, 1945.